Indian Overseas Bank (IOB) is a major bank with its base in Chennai (Madras. Indian Overseas Bank has an in-house Information Technology department that is ISO certified, that has developed the software to provide online banking facility to its customers. This bank has attained 100% networking status and there are nearly 2500 ATMs all over India. IOB also offers Mobile banking and is a bank approved by Govt of India. Having net banking facility is very helpful. It allows transferring money from your account to any other account with ease. The transfer of money can be done to the same Banks branch or other branch or even other bank. However, furnishing correct information is essential such as the account holders name, Bank branch and IFSC code. In order to transfer money from iob to other bank online, you must add the beneficiary or Payee account details, if it is for the first time. To start, you may login in using your id and password, go to select remittances and add the payee details. 11. 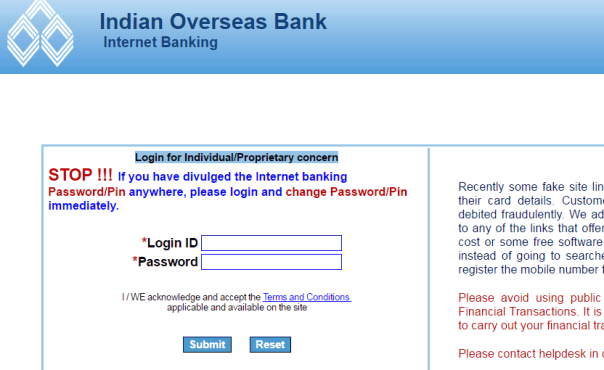 First visit https://www.iobnet.co.in/ibanking/login.do, login your account by entering username and password. 2. Select 'Remittances' from top menu. 3. From side pane, click the 'Funds Transfer' and then select the 'other bank - Neft'. Keep clicking 'proceed' button to reach payment page. Note: You can also use IMPS and RTGS to make payment, read about difference between NEFT, RTGS and IMPS payment Services. 4. Fill below details and click the 'proceed' button. Pay from: it means credit account - just select your own account. Transfer amount to: it means Debit account - Select payee/beneficiary account whom your are sending money. Amount: Enter the amount in rupees. 5. Now enter the 'transfer Pin' and click the 'transfer funds'. 6. After this, you will receive one time pin in your registered mobile number. Enter OTP and complete the ongoing transaction. 11. First login your iob net banking account and click on 'remittances' same as for transferring other bank account. 2. From 'fund transfer', select 'iob account' instead other bank account and click 'proceed' button. 4. Select debit and credit account, remarks something for both. Next enter amount in rupees and click the 'proceed' button. 5. Now input the 'transfer pin' providing by bank and click 'transfer funds' button. 6. Your screen will prompt for OTP and enter the OTP received on your registered mobile number to complete transaction. Calculation: If you have iob net banking account, you can transfer money from IOB to IOB and other banks easily. I need to send money from my IOB to Singapore DBS is it possible. how to transfer from RD account to saving account through internet banking. what righting in debit remarks and cradit remarks. After completing the funds transfer, will I get an Acknowledgement page or a receipt that I can download to show as proof? i don't have remittances in my toolbar. that one is missing for me. what i have to do?